Murad Pore Extractor Pomegranate Mask, US $38 for 1.7 oz., is mask in pretty pink shade that purifies your skin and pores, and helps clear your skin of blemishes and impurities to reveal a more radiant glow. This product works by drawing out impurities, including excess grease, hardened and stuck inside your pores using lactic acid and kaolin. Then, it revitalizes your skin by flooding it with antioxidants that also shields it from damage and aging caused by free radicals and environmental stressors. This product has been specially formulated to benefit people with combination, oily and acne-prone skin types. This product does not use gluten-containing ingredients, and neither does it carry parabens, endocrine-disrupting chemicals that are commonly used in cosmetics and skin care products to serve as product preservatives. Murad Pore Extractor Pomegranate Mask reviews reveal that this product is potent enough in refining and tightening pores. The formula does not contain ingredients that may render it some power for correcting and preventing signs of skin aging from appearing. This product is significantly more expensive than its competitors who promise to deliver the very same claims, and which consist of more or less the same line up of ingredients. Users’ product experience appears varied and likely depends on how individual skin reacts to the product. Murad Pore Extractor Pomegranate Mask is recommended for use 2 to 3 times weekly to help give your fatigued skin a boost. Cleanse before applying the product. Leave on skin for 10 minutes then, rinse off with lukewarm water. Follow through with an intense moisturizing treatment to help restore your skin’s lost moisture as a result of this treatment. 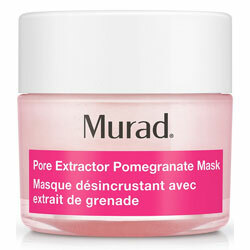 Murad Pore Extractor Pomegranate Mask benefits your skin in rather uncomplicated ways. It clarifies, purifies, and smoothens out your skin. Therefore, it is not difficult to see how similarly this product performs just like most other mask treatments do. Except, the expensive price tag on this product makes it stick out from the crowd. Your skin will experience real, visible improvements from this product but, then again, these benefits are far from unique to this product.